Nelson, an emeritus professor of biochemistry and de facto historian for the UW–Madison College of Agriculture & Life Sciences, has been collecting old scientific instruments, books, papers, and other scientific artifacts from the university and around Wisconsin for the past 45 years. 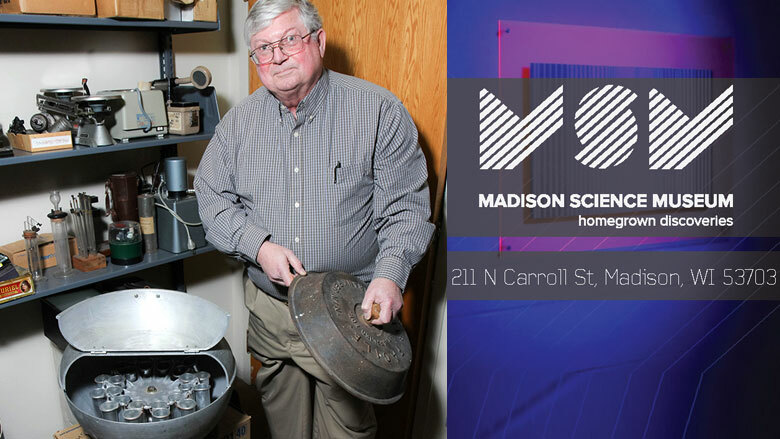 His amassed collection—which currently fills two rooms in the Biochemical Sciences Building and one in the Old Dairy Barn—will form the foundation for the new Madison Science Museum. Nelson, along with UW–Madison Biotechnology Center outreach director Tom Zinnen and others, spent many years searching for a home for the science museum. Initially the goal was to site the museum on the UW–Madison campus. But, after considering parking and public transportation options, Nelson decided that a downtown location would be best and selected the sixth floor of the Madison Area Technical College’s downtown facility. The new museum is just a stone’s throw from the Madison Children’s Museum, the Wisconsin Veterans Museum, the Wisconsin Historical Museum, and Overture Center for the Arts. When Nelson joined the UW–Madison faculty in 1971, he took over the laboratory space previously occupied by biochemistry professor Marv Johnson. “Marv had kept all of his old instruments, protecting them so they didn’t get thrown away. So I walked into a lab that was already full of fifty-year-old instruments,” says Nelson, who hung on to everything—and soon started adding his own pieces to the collection. Over the decades, Nelson accumulated a lot of turn-of-the-century pieces, including early instruments to measure weight, quantities of light, hemoglobin in blood, and blood glucose levels for diabetics. Highlights include the ultraviolet light that Harry Steenbock used in his experiments with rickets and vitamin D; the analytical balance that Karl Paul Link used in his studies of the blood anticoagulant drug warfarin; and the light microscope that Joshua Lederberg used in his Nobel Prize-winning work on sexual recombination in bacteria. Now these instruments—and the stories that go along with them—will be shared with the public at the Madison Science Museum. Exhibits geared toward middle- and high-school students, as well as adult learners, will highlight early scientific discoveries and connect the dots to subsequent medical and technological advances—and their commercial applications. “There are more than 150 biotech spinoffs in the Madison area, and some of them are multi-million dollar businesses. We want to show these accomplishments, too, and really all of the aspects of the state’s science and engineering enterprise,” says Nelson. Exhibits will rotate, giving museum visitors a reason to come back again and again. One of the first exhibits will explore imaging technologies from microscopes to CAT scans to weather satellites. Visit madisonsciencemuseum.org for more information about the museum grand opening and exhibition collection. Nicole Miller is the news manager for the UW–Madison College of Agricultural & Life Sciences.